Back again this week with a Garage floor makeover, the homeowner had a garage floor that was less than appealing, the epoxy coating that was previously placed started to peel, chip, scratched and marred up with tire marks… it seen better days for sure. Enter Custom Concrete Design we came in took that Old Epoxy off and gave it a SUPER Nice Granite Looking Glass Shine. Day one as always is our prep work we came in with our grinders and got rid of that ugly looking, non sticking, peeling everywhere marked up Epoxy floor, cleaned and got it back to its original concrete….now its good to go! Once we had the entire floor profiled and cleaned we started the base coat of colored Epoxy, applied with our Magic Squeegee then back rolled it to even the Epoxy out, we had our chips ready and my spike shoes and out on the floor I went tossing Vinyl Chips like I was feeding the chickens, up in the air to see them drizzle down onto the floor like confetti!! Next was the clean up… the next day we came in and scraped all the loose chips and removed them from the floor, by the way I always throw my chips out at a 100% coverage this insures a complete and even looking floor, never a flaw with this consistent method. 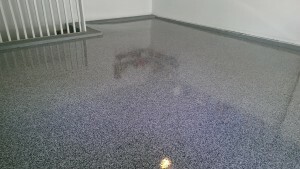 ok now were ready for the Clear UV resistant Epoxy, the coloring in the chips will really pop once this clear Epoxy goes down and the floor will have the appearance of Granite Glass, so just like the base coat we squeegee the Epoxy and back roll….is this floor done? ?… nope not with out a Protective coat of Urethane to protect the Epoxy. Our Client was thrilled with his New Granite Glass Floor, its a glass floor you can drive on!! 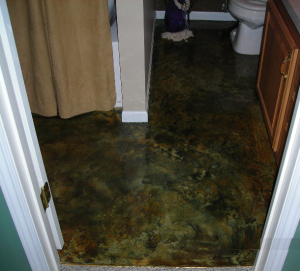 Another Concrete Surface Saved and Beautified by Custom Concrete Design! This one was a whole lotta grinding, back in the 80’s the aggregate look was in, but not in 2014!! – We started the job with 3 days of grinding the entire surface down to a manageable level, but we still needed to build it up a little. Once the grinding was complete , the cracks were open and repaired it was time to pressure wash and get it cleaned up for the next steps, the concrete overlay base coat we put it down by troweling it on with a magic trowel. The verticals we sprayed through a Hopper gun. Now that our 2 base coat’s were in place we had to put down our top coat, once that was in place all that was left was to seal it all down with our Acrylic Sealer, we did add some shark grip additive to the sealer to give it some slip resistance, other than that it was a big job, but pretty simple in procedure. This week we are remodeling a Bathroom Floor, upper level. We came in pulled the lanolin up and laid down some roofing paper, then cut wire lath to fit over the roofing paper and stapled them both down to the wood sub floor about ever inch we placed a staple, so we went through alot of staples even know the bathroom was small. Next we started placing our build-able concrete material in place to cover the wire lath so we would have a solid slab of concrete to work with, once it was established after a few coats a thick 1/4 inch bottom then a skim coat over that, we were ready for some concrete texture, we did a chunky rock texture, we were going for a rustic old world kind of look st that texture really fit the bill. Now that the texture was done it was time to prep the walls for the Acid Stain and the Antique Stain, we sprayed our Acid Stains first, diluting with water as we sprayed some, once both colors were dry we had to remove any residue left over from the acid before using our Antique Stains. We sprayed out our Antique stains and let them dry. Next was sealer, we wanted a high gloss so it was decided that a High Gloss Epoxy was the way to go, once the Epoxy was on we used a great wax to protect it and keep it scratch free. We spent two weeks with this basement floor project, not exactly sure when the house was built, but I believe it was sometime in the late 70’s the view was great the concrete needed some help! !…HEY that’s what I do!! The floor originally had carpet on it, the home owners were kind enough to pull the carpet and dispose of it for me, I came in the first day and began our mission, we started by opening up the cracks that were there and there were alot of them (watch the Video below), then we needed to address the pot marks left behind from the tack strips, once the repairs were made to the cracks with epoxy and the pot holes were filled on with our secret mix, we needed to get that darn carpet glue off, so I pulled out the hand grinder and off I went, once the carpet glue was removed I just proceeded to grind the entire floor to get it ready for our overlay material. I had to put down 2 base coats to get enough build up on the surface to give us a nice clean surface to start our texture, the texture we used was a Tuscan Slate/Skip-Rockdown Trowel, yes it wasn’t really one single texture we did a combination of textures on this one, it made for some interesting but very wicked looks in certain places but all tied together for one AWESOME LOOKING FLOOR! The Texture is on now what? ?…Here’s where the coloring comes in I wanted to use 2 different Chem-Stone Acid stains, ones that complimented each other, but did not compete with each other, so we choose to do the Chem-Stone Brown and the Chem-Stone Umber as mentioned in the Video located here. First one that went down was the Umber Acid, this acid gives the concrete a goldish tone, once I had the look I was after, it was time to bring in the Brown Acid Stain, once both colors were sprayed on and I liked what I was looking at it was time to let it do its thing sit overnight and come back the next day. Today was just needed to remove any and all residue left over from the Acid Stains, so we scrubbed it down very well and shop vaced it up so it had time to dry out over the weekend, now it was time to figure out what I would do with myself with a day off, oh wait I live on the lake!! 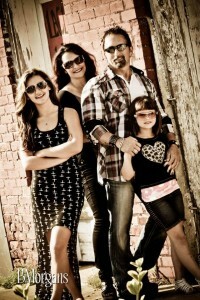 !… So I took the my Family out on the Boat for a great weekend of Boating! ok back to work,,now it was time for the Epoxy to get laid out, once we got the walls prepped it was GO TIME! !…the Epoxy went down smooth as usual and it looked like a sheet of glass, the colors were just poppin and the floor was just BADASS!! 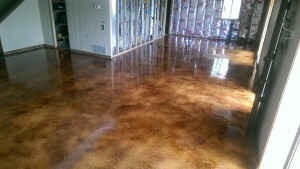 Another Basement Floor saved and Beautified by Custom Concrete Design! SWEET Decorative Concrete Artwork done to any Concrete Surface Inside or Outside!! 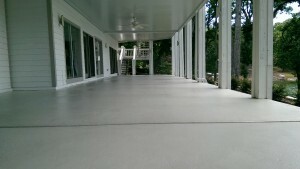 Comments Off on SWEET Decorative Concrete Artwork done to any Concrete Surface Inside or Outside!! 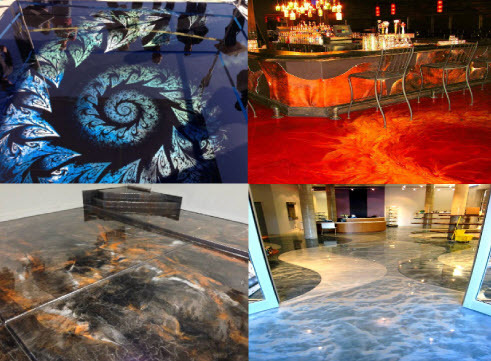 Who Would like to have an Amazing Garage Floor, Man Cave Basement, Kitchen Floor, Front Stoop, Pool Deck, Driveway etc…., or just some SWEET Decorative Concrete Artwork done to any Concrete Surface INSIDE or OUTSIDE??…. COMMENT BELOW! !